I have finally got to finish making my waterproof flashlight which took me almost two weeks. One thing that motivated us to build this project was the boys trapped in a cave in Thailand, as this would have really come in handy for them. The flashlight ended up looking really cool after decorating it and it worked underwater because of the PVC Pipes and the cover on the switch. My flashlights could even be put in as a set of four in a box. The black lever on the flashlight is a rubber cover for the switch. The switch was sticking out from one side of the PVC Straight Pipe and the LED had space at the front of the flashlight to shine. The battery is hanging loose on the inside. 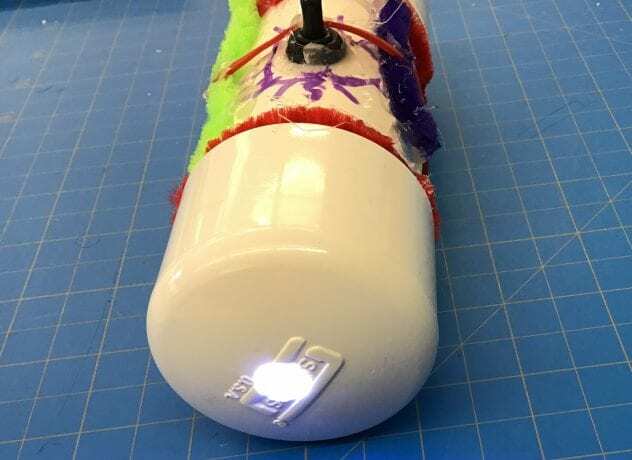 The parts I used for the flashlight are 2 PVC Caps, a 4 inch PVC Straight Pipe, a switch cover, a rubber band, markers, pipe cleaners, a LED, a battery, a battery, a battery holder, and wire. I also used a drill press, a soldering iron, and solder in order to assemble the flashlight. Overall, I thought that this is a fun project and a great learning experience. There are two pictures of my flashlight below.